Just finished 8.5-hour ABBA fest, from 1pm to 9.30pm. 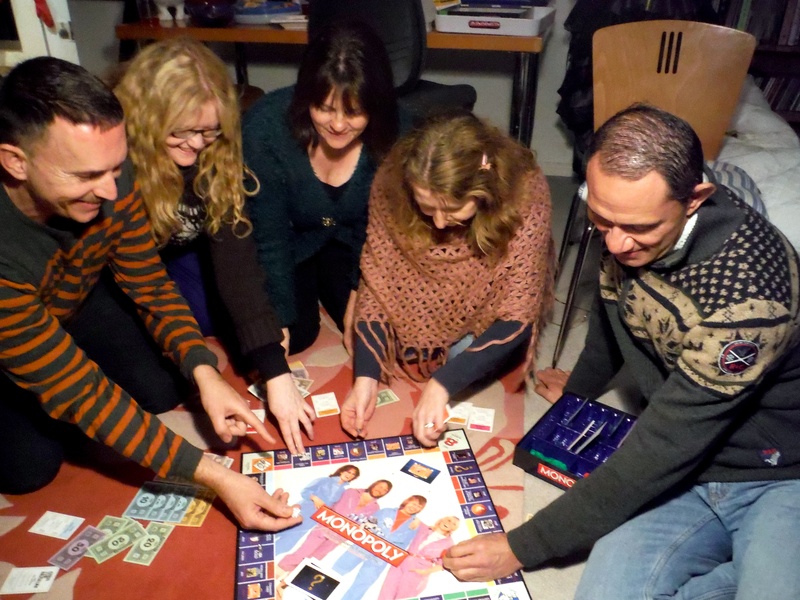 ABBA Monopoly was played and lots of rare vids, thanks to youtube. After three hours of playing ABBA Monopoly, we still hadn’t passed Go to collect $200 even once! Because every time we landed on an ABBA song (which had a title deed) or ABBA member, we’d get so excited and chat about some aspect of ABBA trivia. The tokens are great, I had Bjorn’s star-shaped guitar. There was a disco boot, Napoleon’s hat (Waterloo), a telephone (Ring Ring), a gold record, and several others. The Take A Chance and Community Chest cards mostly had ABBA references and were written in English and Swedish. We all wanted to get the Take A Chance card that said: “Land on Agnetha Faltskog …” D said: “I’d give up several Hotels for that!” Was lots of fun. Started with LOTS of discussion re: Frida’s latest heart-felt revelations on the Homage to Frida page. Read them here, including her four favourite dinner guests ever and her deepest held beliefs. 3 hours of ABBA Monopoly play and none of us managed to make it round the board even once, despite rolling two dice at a time!!! (too much talk about the board’s ABBA-related features). Next Next post: Found ABBA Photobook bargain!